Three rainouts contributed to keeping Penn baseball from their first 20-win season since 1890. It is safe to assume Penn would have won the majority if not all of those 3 games, since they had already defeated those particular opponents once each during the season. Nevertheless, their 18-8-1 record was a very solid one as Penn scored double digits in the runs category numerous times. In fact, they scored in double digits in 16 of their 18 wins, and only lost once when tallying more than 9 runs (May 5 loss to Cornell, 13-10). They averaged an impressive 15.9 runs per game. 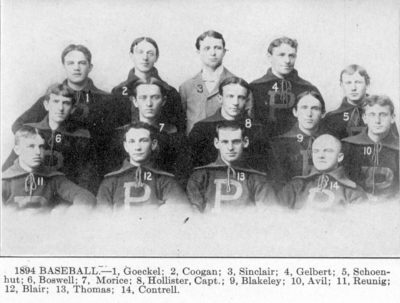 The yearbook lists eighteen players for this team, thirteen of whom are included in this photograph. The team consisted of three catchers, five pitchers, one shortstop and six fielders as well as three substitutes. Boswell, Coogan, Goeckel and Thomas went on to play professional baseball. Both Coogan and Thomas served as Penn baseball coaches during the first decade of the twentieth century.